***Restock*** The second imprint of Kraken Recordings, the new Danish dubstep label, features tunes from two of the most promising dubstep producers of the moment: Copenhagen-based RUF (a.k.a. JSL a.k.a. Wolf Man) and London-based Scandalous Unltd. (of the True Tiger crew). 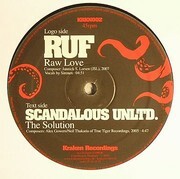 The A-side features the mighty “Raw Love”, one of the most talked-about and hyped tunes on the prominent dubstepforum. The B-side holds a close-kept secret track from the well known producer team behind the successful True Tiger Recordings: “The Solution”, a certain dance floor smasher with an amazing bass line that will destroy every sound system and send the crowd into a pull-up frenzy! Statements quoted below, tell of a much-anticipated second release from the Danish bass connoisseurs of Kraken Recordings. RUF:JSL (aka RUF and Wolf Man) has since the mid-90´s been a prominent feature in Denmark on both the Techno, House and Hip Hop scenes, however current productions are focused mainly on the bass-heavy Dubstep as well as Grime and Bashment. Since 1995 JSL has released several recordings on both Danish and American labels combined with remix work for numerous Danish artists. Furthermore, he’s one fourth of one of the most successful and best established event/sound system crews in Copenhagen – OHOI! and head of graphic designs for both OHOI! and Kraken Recordings. Scandalous Unltd. : Production duo and DJ outfit Scandalous Unltd. hail from Watford, north of London. Duo Stanza & Gowers signed their first production deal with Polydor Records, but after two years Scandalous Unltd. decided that they would start their own label, True Tiger Recordings. From this point on the boys have been causing a stir with their production on the underground dance music scene in the UK. More recently Scandalous Unltd. have produced for the likes of Dizzee Rascal, Kano, Sway, Plan B, Wiley, Asher D, Ny, Purple Simba, amongst others. Their unpredictable stand out sound has pushed them to be seen as one of the UK’s current hottest production outfits. Scandalous Unltd - "The Solution"